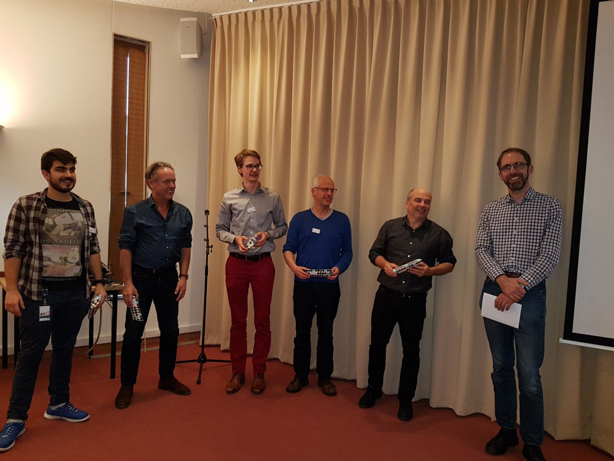 The NVBM autumn symposium entitled “The Heritage of Buys Ballot” was held on 17 November 2017 at Wageningen University. The symposium was entirely dedicated to the 200th birthday of Buys Ballot. An impressive line-up of speakers discussed the current research and how Buys Ballot, should he be alive today, would have dealt with this. Here is a brief report of this day with photos of the speakers and participants. After the opening words of NVBM chairman Albert Klein Tank, Bas Nugteren of Sonnenborgh (Utrecht) took the floor. 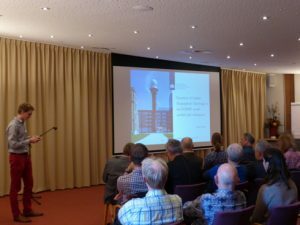 He gave a presentation about the setting up of the KNMI and Buys Ballot in Sonnenborgh, and how Buys Ballot, as an outstanding organiser, handled the foundation of the KNMI. He really liked the “crowd funding” approach, because he even organised and financed a polar expedition in this way. 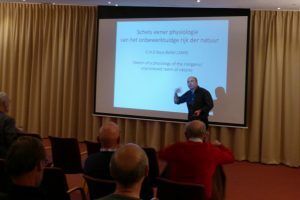 Subsequently, dynamic meteorology was discussed by Aarnout van Delden (Institute for Marine and Atmospheric Research Utrecht), who showed how much various aspects and innovations in meteorology have changed since the time of Buys Ballot. With heavyweights like Rossby, meteorology has of course made huge leaps since the “law” of Buys Ballot, but Aarnout also emphasized that we still do not really understand fairly basic matters concerning atmospheric dynamics. 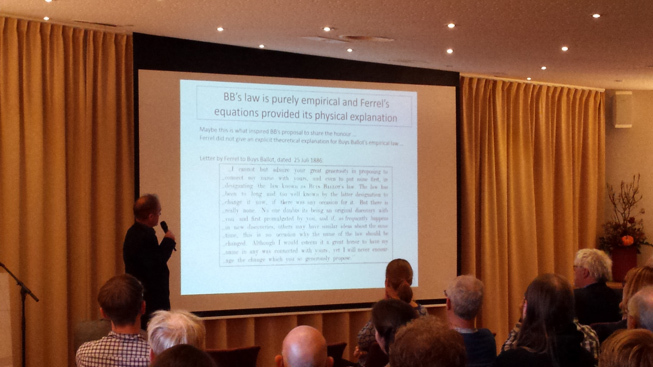 Frans van Lunteren (Leiden University) argued in his presentation that Buys Ballot’s law should not be a law at all in the usual sense of the word, and that the fact that Buys Ballot’s name is attached to this “law” is partly due to a series of coincidences. For example, William Ferrell kindly declined the honour of being co-named when Buys Ballot offered him as such on the basis of Ferrell’s (earlier) work. The morning part of the symposium was concluded with a nice vlog from NVBM member Reiner Ronda about his experiences during the EMS Annual Meeting in Dublin. 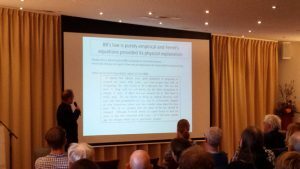 After lunch, Pieter Smets (KNMI) continued the symposium with an interesting presentation on how infrasound can be used to verify the dynamics of Sudden Stratospheric Warmings in the ECMWF model. 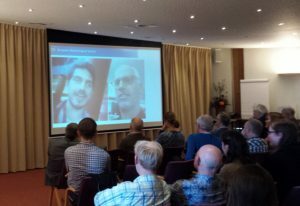 Measurements so high in the atmosphere are scarce, so every form of validation is welcome, and infrasound can make a valuable contribution to this, according to Pieter’s story. 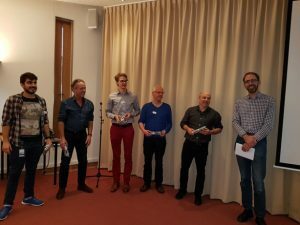 The only foreign speaker at the symposium was Andrew Ross (University of Leeds), who discussed the challenges of predicting frost and fog in local valleys in England. High-resolution modelling and observations show that such valleys can become many degrees colder than the surrounding hills at night, a phenomenon that can be easily missed in coarser resolution models. The second part of the vlog about the EMS Annual Meeting in Dublin was provided by NVBM member Aristofanis Tsiringakis, who enthusiastically illustrated his experiences in a video. The final contribution was made by Jordi Vilà (Wageningen University). Jordi gave a passionate speech about high-resolution modelling of the interaction between vegetation and the atmosphere in the Amazon, where cloudiness, radiation, the opening of stomata of plants and evaporation form a complex system. The symposium concluded with a word of thanks to all speakers, followed by a snack and a drink, where everyone agreed that Buys Ballot today would have been an innovative researcher and an enthusiastic organiser.